Updated third floor condo with great southern and eastern exposure and two deeded parking spaces visible from the condo (one covered). This unit has stainless kitchen appliances, granite counters, updated lighting, hardwood floors, a wood burning fireplace, large storage closet, walk in closet in the master bedroom and a large covered deck off of the kitchen for those warm summer days. The bath has been completely updated with tile floors, tile shower, newer lighting and a large glass shower door. Great windows complete this condo. Wood shutters cover all the windows except the bath. Laundry is across the hall from this unit. The living area feels large and lends itself well to entertaining. The storage closet has room for your bicycles, check out the pics. This building has a great party room with a pool table, poker table, bar area, treadmill plus restrooms and a shower. The outdoor pool is off the party room. 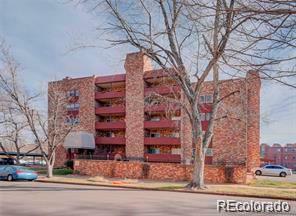 Great location next to the Cherry Creek Trail, restaurants, parks & more.